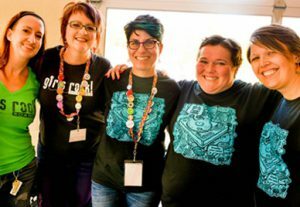 Girls Rock Roanoke relies on diverse and motivated volunteers—from women and gender non-binary performers and band managers to instrument teachers, sound engineers, workshop leaders, and teen mentors—to make our camp happen. If you’d like to become part of our crew, download the Volunteer Fact Sheet 2019 so that you can familiarize yourself with our program needs. You do not need musical experience to volunteer for Girls Rock. Repeat. YOU DO NOT HAVE TO KNOW A THING ABOUT MUSIC TO VOLUNTEER FOR GIRLS ROCK ROANOKE. All you need is a passion for helping girls and gender non-conforming youth feel empowered and confident. Have a great idea for a volunteer position that’s not on this list? Contact our Executive Director and let us know! This is one of the most rewarding volunteer positions at Girls Rock Roanoke camp! This full-time role includes facilitating the creative process with a group of five to six campers that form one band. Band Managers work closely with their band, helping campers write, practice, and perform a song at the GRR Showcase. Band Managers assist campers with everything from plugging in to singing in tune, from the early songwriting stages to their final dress rehearsal. Ideally, Band Managers should have experience playing an instrument (guitar, bass, keyboards or drums) in a band and some songwriting experience, though it is not required. Together with other camp counselors and band assistants, Band Managers also provide advice and support to campers that are dealing with low self-esteem, personal and interpersonal issues. Previous experience working with children is a plus. Band Managers receive a small stipend. Band Assistants support Band Managers and campers in multiple ways throughout the camp week – anything from song-writing and band practice to assisting with camp workshops and camper needs. Band assistants will gain leadership and collaboration skills while mentoring campers. Music experience is not necessary but is a plus. This position has flexible hours, but ideally Band Assistants will be available at least half of each camp day. Band Assistants receive a small stipend. There are a limited number of these positions for girls and gender non-binary youth ages 16-18 who are interested in gaining leadership and collaboration skills while mentoring younger campers. Teen mentors support band managers and assistants, help lead activities and provide lots of encouragement to campers. This is a great opportunity for mature teens. Music experience is not necessary but is a plus. This position requires one week of full-time volunteering at Girls Rock camp. There are 6 instruments taught at camp: electric guitar, bass, ukulele, keyboards, drums & vocals. Instrument Teachers should have basic proficiency in at least one of these instruments and have a broad enough knowledge base to be able to break down fundamentals in a language relevant to campers ages 8-16. Remember that the skill level of our campers will vary – some have been taking lessons for years while some may have no experience at all. This is a great opportunity to share your love of music and your awesome skills with young girls. Previous experience being in a band or working with children is a plus. Hours for these positions have some flexibility. Instrument Instructors receive a small stipend. Do you have an area of expertise to share? Consider leading a workshop for our campers! Workshops are specialized classes that last 1- 1.5 hours. Workshop topics might include: gender roles, media literacy, music HERstory, body confidence, poetry, social justice, building positive relationships, consent, self-defense, stage presence, songwriting, tech-talk, screen printing, DIY clothes, zine-making, button-making, poster and flyer-making, and MORE! We’re looking for female and gender non-conforming musicians, singers, bands, and DJs who can perform for campers. Join us for our lunch hour and inspire our young rockers! We need folks year round to make camp happen! Join one or more of the following committees: Gear, Programming, Fundraising, Marketing, Community Outreach, and Boys Rock for Girls Rock. We also welcome new ideas! If you know a role you can play to support Girls Rock Roanoke that isn’t mentioned here, please let us know! We welcome your participation! Girls Rock Roanoke strives to provide diverse, inspiring, and realistic role models for our campers. We invite individuals who self-identify as women, trans* or gender non-binary to apply for roles with direct contact with campers. This includes band managing, instrument instruction and workshop instruction. We also welcome individuals of any gender identity to volunteer with us in indirect roles such as fundraising, design work, loading gear in/out, and more. Girls Rock Roanoke is an LGBTQI inclusive and affirming organization and we seek to create a welcoming and supportive space for everyone.